The General Brand 55mm Filter Kit with Lens Hood combines a host of lens-centric accessories designed to complement photographing in a variety of conditions. 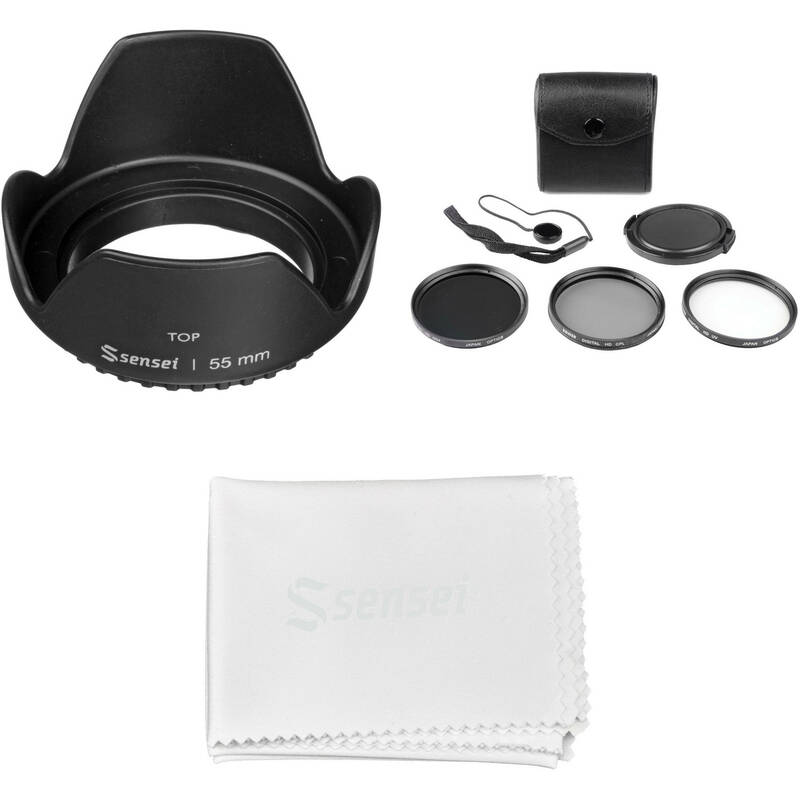 The 55mm filter kit contains a solid neutral density 0.6 filter, a UV filter, and a circular polarizer filter along with a lens cap, cap keeper, and a protective carrying case. Additionally, a 55mm screw-in tulip lens hood is also included, as well as a microfiber cleaning cloth. The 55mm Screw-on Tulip Lens Hood from Sensei mounts onto your camera lens to prevent glare and lens flare by blocking out stray light. The lens hood also adds shock absorption to help protect your lens from impact damage. It easily screws onto any lens with a 55mm diameter and includes a locking collar for consistent positioning. As this lens hood can be used with lenses of varying focal lengths, its tulip shape is designed to prevent vignetting while still blocking unwanted light from entering your lens. The hood is ideal for full-frame lenses with focal lengths longer than 20mm, and APS-C lenses with focal lengths longer than 15mm. This 55mm Digital Filter Kit from Bower includes an ND4 filter, a circular polarizer filter, and a UV filter, as well as a lens cap, and a cap keeper. A carrying case is provided to keep your filters safe when not in use. Box Dimensions (LxWxH) 6.1 x 4.3 x 1.9"
Box Dimensions (LxWxH) 3.6 x 3.0 x 1.9"
55mm Filter Kit with Lens Hood is rated 4.7 out of 5 by 3. Rated 5 out of 5 by yon from Good price. Kit works perfect for the price.